U1000 – A Powerful Gadget from Dopod! Dopod recently unveiled a new model known as U1000, after a successful launch of its predecessor, Dopod 900. 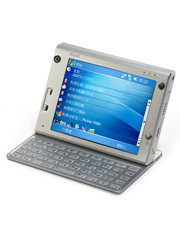 This Window Mobile 5.0 handheld device is the world first 3.5G mini laptop with powerful features combining GPS navigation, wireless internet access, mobile phone and camera functions. U1000 is powered by Intel Bulverde, the top-of-the-line of Intel Xscale PXA27X processor running at 624 MHz. supported by 256MB ROM, 128MB RAM, 8GB mini hardisk and external memory of up to 4 GB. With a 5 inch 65,536 colors TFT huge display LCD (640X480 pixies resolution) and 3.5G (HSDPA) support, the user can experience the new digital life by watching movie and access online multimedia contents on the move. HSDPA (High Speed Data Packet Access) is the next evolution of cellular high speed connectivity, capable of downloading data up to 1.8Mbps. To ensure sufficient battery life time, the gadget is bundled with a high capacity 2200mAh Lithium Ion battery, which extends the talk times to 5.5 hour and standby time to 300 hours. What is more! Dopod U1000 is equipped with VGA/S-Video output function that can be connected to projector for live presentation. This is a great feature especially for business executives that travel extensively. Weighted at 375g with dimension of 133mm X 98mm X 16mm, it may not be pocket-friendly. However by features and specifications, it is one of the most powerful gadgets with combination of all advanced features such as wireless 802.11b/g internet access, 3.5G HSDPA high speed transmission and GPS navigation powered by Intel Xscale PXA270 624MHz processor.